The major technological advance in diesel-electric submarines was the development of the snorkel, which allowed the operation of the diesel engines at periscope depth, and the development of the Type XXI U-boat by the Germans, the first submarine designed for greater performance underwater than on the surface. The snorkel was widely adopted by the navies of the world and improved after the war, while the Type XXI submarine revolutionized submarine design in all navies. The US Navy designed the “Tang” class to take advantage of everything learned from the Type XXI U-boat, the new boats were so much better they made the existing fleet boat obsolete, but these were too expensive in the post-war period to produce enough of them to satisfy all the needs for submarines. In 1949, the Navy began the Greater Underwater Propulsive Power Program, for which the acronym GUPPY was created by dropping the last “P” to convert and back-fit existing late production “Gato” and “Balao” class fleet submarines with many of the German Type XXI submarine design features. Deck guns and anti-aircraft armament were removed, the outer hull was streamlined, the conning tower replaced by a streamlined sail, larger propellers were fitted, more air conditioning was installed for the greater heat generated by t he electric motors, and the battery capacity doubled. The end result was submarines which were capable of 18.2 knots submerged, equaling the Type XXI, and exceeding their surfaced speed by 0.4 knots. The GUPPY program included three major phases. Guppy I, which was essentially experimental, involved only two boats, Odax (SS‑484) and Pomodon (SS‑486), which both became part of the main program, and led to the GUPPY IA AND IB boats; GUPPY II, which converted 24 boats during the late 1940s and early 1950s by reducing the diesels from four to three to increase battery size and power; and GUPPY III, which updated several GUPPY II submarines by lengthening the hull for additional equipment. The ke y features of all three were extensive streamlining of the hull and sail, larger and more powerful batteries, and a snorkel air‑breathing system. The GUPPY II and III submarines were distinguished by a tall sail, termed the “northern sail.” These boats were "rode hard." In the Atlantic, they had to support ASW training with US and NATO Task Groups, run barrier patrols in the Greenland-Iceland-UK-Gap, that narrow passage through which the Soviet submarines would deploy to threaten the Atlantic sea lanes. In the Pacific, boats from Pearl Harbor, San Diego and Yokosuka watched the exit points from the North Pacific ports such as Vladivostok. US and other NATO boats watched the Kola Peninsula. These deployments often found the boats in extremely rough weather; on the North Atlantic run, they operated in Force 5 and 6 and higher seas constantly, while those in the Pacific often had to deal with typhoons and enormous storms out of the Gulf of Alaska. The streamlined GUPPY bow dug deep into the waves and the early “step sail” gave little protection to the bridge crew, while control during snorkeling was difficult at best and sometimes impossible. The tall “northern sail” solved the problems, and eventually all GUPPY boats were so modified during their careers. Most information about the operations of GUPPY submarines during the Cold War remains classified to this day. Without converting the fleet boats of World War II to the GUPPYs of the Cold War era, the success of submarine cold war operations would not have been possible. 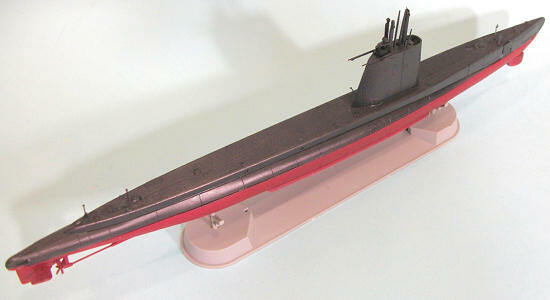 These submarines "held the line" until the SSNs and SSBNs took over. 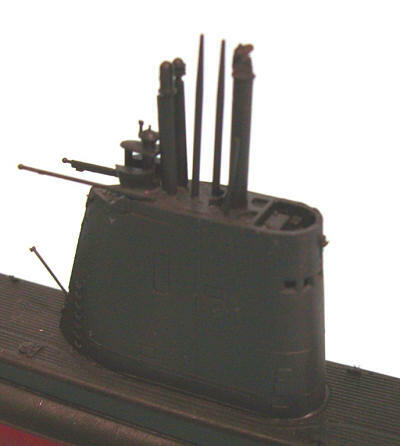 This is the fourth or fifth iteration of the development of the US Fleet boat from the 1941 configuration to the Gupppy-II as represented in this kit. The hull is divided at the waterline, allowing it to be built as a waterline model for an at-sea underway diorama. All parts are crisply molded. Decals are p rovided to do either USS Cutlass (SS-478), or the same submarine as now operated by the Republic of China (Taiwan) navy as the “Sea Lion,” which is now the oldest diesel-electric submarine in the world as of March 2011. The AFV Club Guppy II kit is as good as the other US fleet boat kits they make, and provides a very hassle-free project to create a Guppy II submarine. It took me the better part of an afternoon to assemble the kit, with the biggest problem being the extremely small deck cleats, which I finally figured out how to attach them to the deck without making a contribution to the Carpet Monster. Most GUPPY boats operated in a flat black overall scheme above the water line with lower hulls in red anti-fouling paint. While they carried hull numbers on the sail and bow while in port or on non-operational cruises, when they went to war they painted out the numbers. An easy kit that provides an interesting development of the US fleet boats.